Check out this list of stadium collapses. 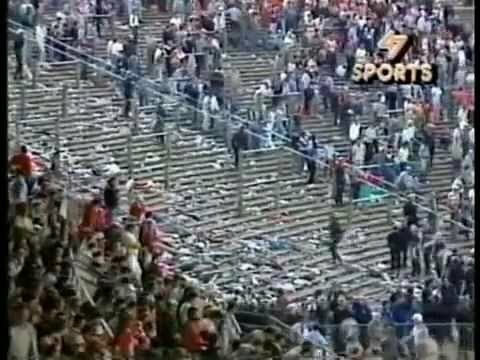 It's time to look back at some of the most epic stadium collapses of all time, what happened that caused the collapse and how they fell: videos and pictures included. There are a number of stadiums that have fallen for one reason or another. These include the Husky Stadium collapse, the Maracana crumbling in Rio, and a soccer stadium collapse tragedy in Iran. So what are the worst stadium collapses in history? Take a look at this list and you'll see what sports stadiums have fallen apart, either because of age or a failure in its structure. The Metrodome, home of the Minnesota Vikings and Brett Favre's ego, has a special type of roof that is rumored to be the largest application of Teflon on Earth. This means that the roof is mostly supported not by beams but by air pressure that rises against the roof and helps support its dome-like shape. That is, until something from the outside causes it to deflate. In this case, snow. So watch the embedded video and guess what happens when there is too much weight on the roof: It deflates and eventually the snow tears gashes in the fabric. Apocalypse ensues as this happens in mid December of 2010. This occurred at 5 a.m. on a Sunday morning, so no one was injured. The 1985 European Cup Final was a match that was supposed to take place between Liverpool and Italian football team Juventus at 50+-year-old Heysel Stadium in Brussels, Belgium. The choice of the stadium was already controversial since it was all but unsuitable for a match of this magnitude; it was old, it was too small for a European Cup Final and large parts of the stadium were crumbling, as much of it was constructed from cinder block. Some fans even kicked the cinder block in to enter the stadium. About an hour before kick off, a number of Liverpool fans charged a fence and spilled onto the seating area for Juventus fans. The Liverpool fans were so threatening Juventus fans ran away, fearful for their lives. They found a brick wall stopping their way and they attempted to climb upon it. Many escaped, but the pressure of so many fans trying to climb the wall resulted in its collapse. In the end, 39 people perished. The game was held out of fear there would be one more violence and Juventus won, 1-0. British Prime Minister Margaret Thatcher put pressure on all English sides to withdraw from European competition and finally, UEFA, the European football governing body, banned all English teams from playing other European teams for five years, with Liverpool getting an extra year. Imagine practicing football moves for your next Sunday game and all of sudden the practice dome is caved in and ripped apart like it was nothing. 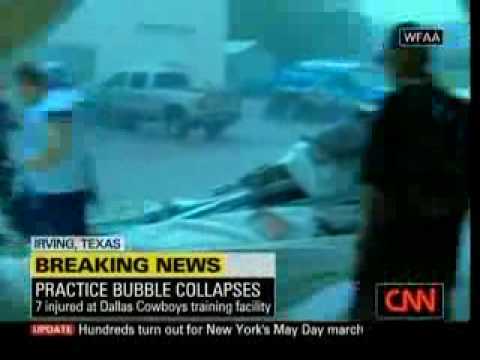 That is exactly what happened to the Dallas Cowboys practice stadium when winds short of the force of a tornado (around 70 MPH) blew through its walls. Twelve people were injured, the special teams coach broke his back and was very close to being paralyzed, and 70 people, including 27 players, experienced what they would probably call the worst season ever. In this incident from 1982, a part of the University of Washington's Husky Stadium collapsed while under construction. Everything was going as normal during the construction for the stadium expansion under a worker noticed a buckle in a key part of the support structure. Just in time, the supervisor ordered the site evacuated. It took 12 seconds for the skeletal steel structure of the stadium to collapse into a pile of rubble, all complete with the workers running for their lives, barely escaping the cascading mess. It was all captured by a photographer who happened to be riding his bike nearby. It was also witnessed by the university's athletic director and his staff, as their morning meeting was interrupted by the shock of seeing millions of dollars plummet to the ground.